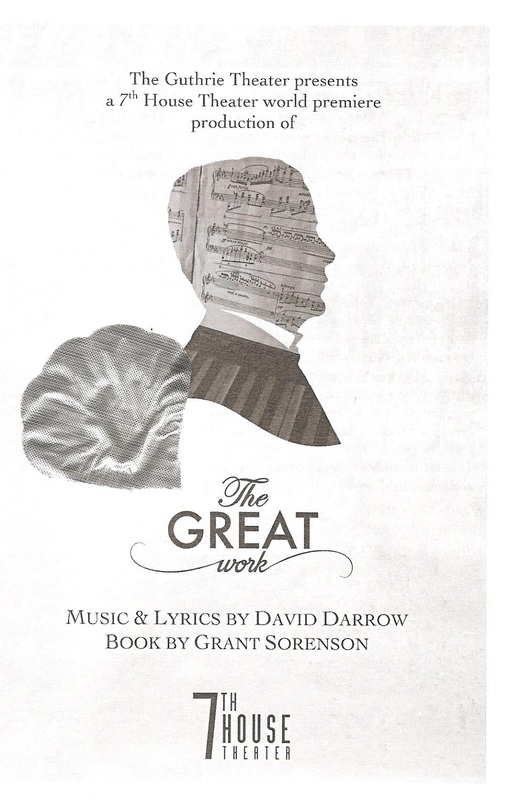 It could be considered an act of hubris to name a new piece of music-theater The Great Work. But in the case of 7th House Theater's new original musical, their second in two years and just the fifth production in the short life of the company, it's a fitting title. 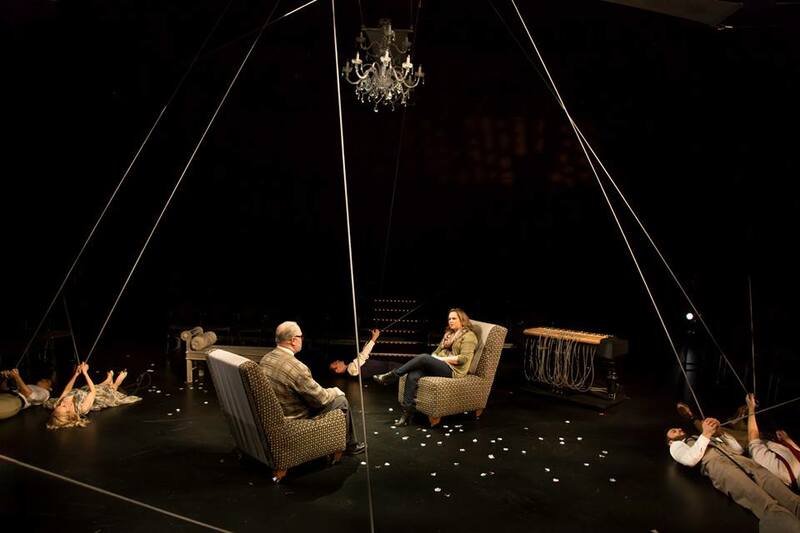 This small and lovely story of an Austrian composer returning home, with his estranged late-in-life daughter in tow, is beautifully and poignantly told in just over an hour through stirring original music and innovative use of movement, props, and set design. A fruitful collaboration between 7th House company members (music and lyrics by the uber-talented David Darrow, book by Grant Sorenson, choreography by Cat Brindisi, directed by all three), the wonderful eight-person ensemble, the gorgeous six-person orchestra (directed by Jason Hansen, who also did the orchestrations), and creative set designer Kate Sutton-Johnson, this truly is a Great Work. I know these next two weeks are busy for many of us, but if you can spare an hour in your schedule to see this show, you will be rewarded (be sure to get your tickets soon before they're gone). We meet acclaimed Austrian composer and pianist Hans Gartner at a turning point late in his life. He decides to return home to Vienna to complete his greatest work. Because he's in ill health, his estranged daughter Charlotte reluctantly accompanies him. He was absent for much of her childhood and did not react well to finding out she's gay, so Charlotte understandably has mixed feelings about this trip. But more than anything Hans wants to heal his relationship with his daughter, because perhaps she is his greatest work. He begins to tell her of his life in Vienna 60 years ago, and his memories become real before us with a flurry of white and silver flower petals. His was a life full of promise, joy, missed opportunities, and heartbreak. Through the stories Charlotte begins to see her father in a way she never did before, and Hans is able to achieve some peace with his past and his present. David Carey and Andy Frye play the older and younger Hans, respectively, and together create a picture of this man, one young and naive, the whole world before him, the other older and wiser and full of regrets. Kendall Anne Thompson is wonderful as Charlotte, and imbues this gorgeous music with such emotion that whenever she opened her mouth, the tears immediately came to my eyes. David and Kendall create a painfully beautiful and complicated father/daughter relationship. David's Hans is truly the heart and soul of this piece, his performance an anchor in this talented young cast. The rest of the ensemble provide vocal and story support as multiple characters and figures walking in and out of the scenes, including Bergen Baker as Hans' lost love, Shinah Brashears as his spirited piano student, a charming Maeve Moynihan as his sister, Aleks Knezevich as the man with an offer Hans can't refuse, and Adam Moen with a bit of comic relief as a dedicated servant. All of them sing like a dream, and although I was disappointed to see them wearing mics in the small space of the Guthrie studio (I'm always in search of that elusive unmiked musical), the music sounded grand. 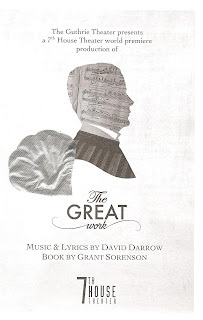 7th House's first new original musical Jonah and the Whale employed a folk/Americana style (written by David Darrow along with Blake Thomas, I'm still waiting for the cast recording!). Showing his versatility, David has here composed a score that's more traditional musical theater, classical and orchestral, but just as strong. There's no song list in the playbill (perhaps because it wasn't finalized at the time of printing? ), but I counted about eight or so distinct songs, varied yet consistent in tone, with soaring melodies and harmonies that make you want to shut your eyes and just listen. I don't know if David's been to Vienna, but the song about Vienna sounds like he has. I only spent a weekend in Vienna but I lived in Salzburg for four months (which I seem to be talking about a lot lately), and this song perfectly encapsulates my feelings about my long ago Austrian hometown. This is the kind of music that brings tears to your eyes, perhaps without even knowing why. Grant's book weaves a story around these songs with moments of humor and hope, as well as poignancy. Seriously folks, these kids have talent! The Guthrie's black box studio is here set up as a theater in the round, or rather, square. Kate Sutton-Johnson's set design includes a very cool piano/bench piece that floats around on wheels, and just a few other benches and chairs moved in and out of the bare stage. But the main feature of the set is up above. I'm not even sure how to describe the array of bungee cords, flowy fabric, and flower petals, all innovatively used by Cat (who you can see on stage downstairs in the Proscenium) in choreography that's less about dance steps and more about movement that enhances the storytelling and tone. And I must mention Samantha Haddow's costume design that ranges from crisp and modern black and white to some stunning period ball gowns. This is a story that celebrates music and art as well as family and relationships, and explores that delicate balance between the two. It's a truly beautiful creation of music, movement, words, and props, with many thoughtful lovely details. 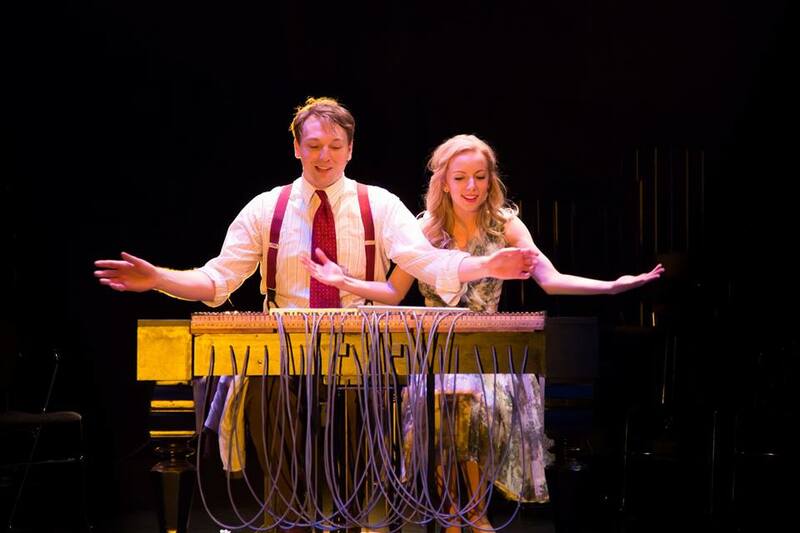 I said it last year and I'll say it again - 7th House is the future of music-theater, and the future looks bright. The good news is we don't have to wait another year for their next production; they are presenting a new adaptation of Virginia Woolf's novel Orlando next summer. 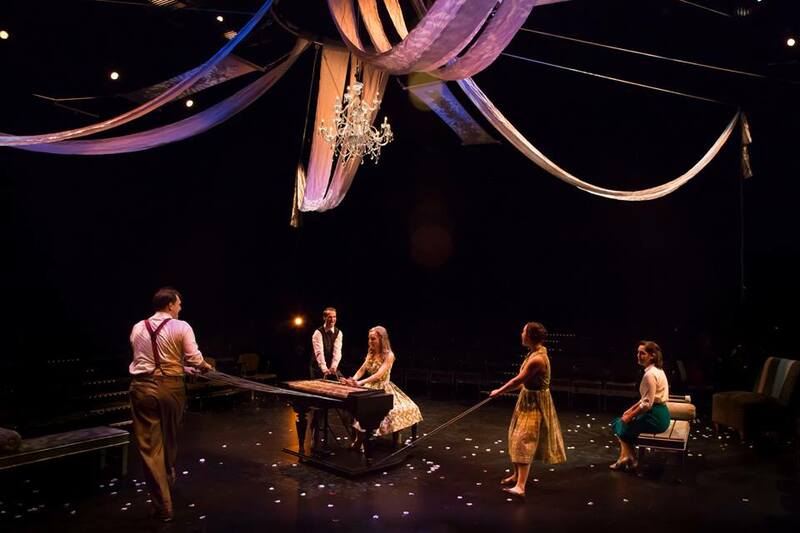 So head down to the Guthrie soon, and then mark your calendars for June to experience the work of this promising young theater company. Wow, this sounds so good! I love it when companies creatively explore what they can do with their space like this. It makes me think of Sandbox Theatre's The Little Pilot. Attended on opening night. A must see new musical and performance with beautiful music, innovative set, classy costumes, and a top-notched cast. It will move you!